Scotland’s Jura Distillery has released 2 Special Edition Gift Packs for the Christmas and New Year market. The releases will consist of a 10 year old bottled at 40% abv and a 12 year bottled at 40% abv. The Jura 10 is a single malt matured in American White Oak ex-bourbon barrels for 10 years with an aged Oloroso Sherry cask finish. Two full-size Jura 10 gift packs are available – one with a compact copper hip flask shaped in the form of Jura’s unique bottle. The other contains a pair of special edition branded glasses alongside a 70cl bottle of Jura 10. The Jura 12 is matured for an additional two years for further influence from the Oloroso Sherry casks. 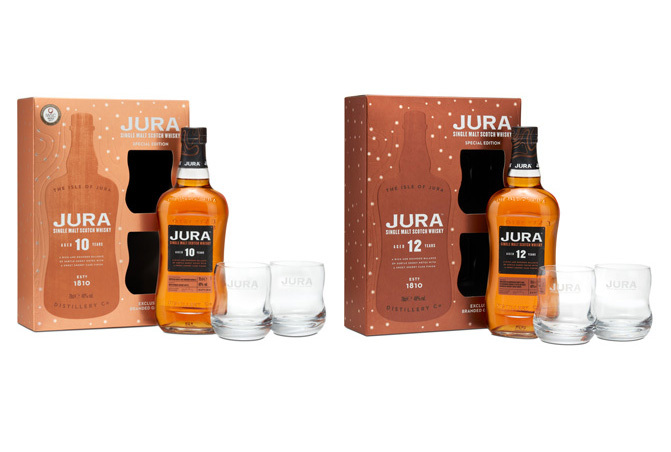 The Jura 12 gift pack contains a pair of special edition branded glasses alongside a 70cl bottle of Jura 12. Jura 10 and 12 are available from UK supermarkets, Amazon, The Whisky Shop and all good drinks specialists.